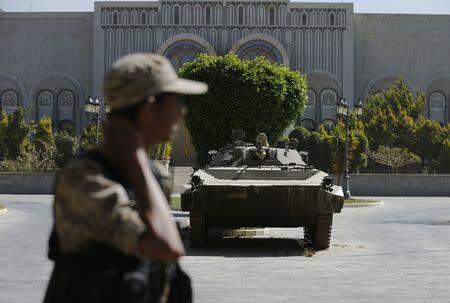 SANAA (Reuters) - Fighters from the Shi'ite Muslim Houthi militia took over a special forces base in the capital and a coast guard station on the Red Sea on Wednesday, military sources said, in a sign the group was consolidating its dominant position. The clashes at the Sanaa base started late on Tuesday when the Houthis shelled the camp with heavy weapons. Fighting lasted around six hours, soldiers from the camp said, and at least 10 people were killed. The troops had been trained and equipped by the United States as an elite counterterrorism unit during the rule of ex-president Ali Abullah Saleh, who was ousted by Arab Spring protests in 2011, military sources told Reuters. The Coast Guard post in the port city of Hodeidah was seized after moderate gunfire and military sources did not immediately confirm any casualties. 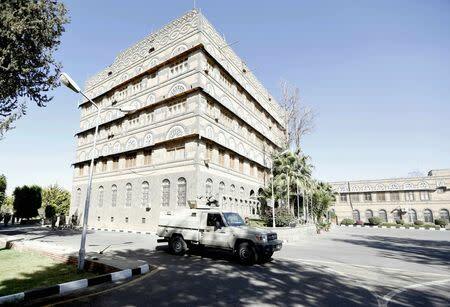 Houthi militiamen took control of Sanaa in September, eventually leading President Abd-Rabbu Mansour Hadi to flee to the southern port city of Aden this week where he is seeking to set up a rival power center with loyalist army units and tribes. But the Houthis still have some of the military's most powerful units on their side throughout most of Yemen's north. Tens of thousands of protesters marched in Sanaa on Wednesday to denounce Houthi rule. Security forces loyal to the group dispersed some of the crowds with tear gas and gunshots fired into the air. For more than a decade the United States has watched with alarm as Al Qaeda in the Arabian Peninsula -- the most powerful arm of the global militant group -- has grown in Yemen as the political chaos has mounted. The U.S. military trained and kitted out Yemeni soldiers under Saleh, and under Hadi the CIA has stepped up drone strikes aimed at killing suspected militants. 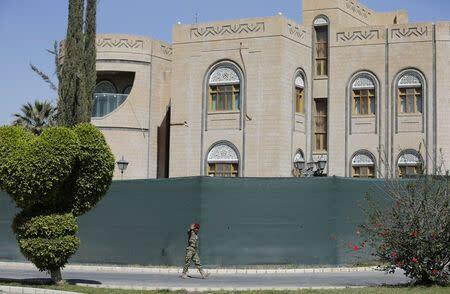 U.S. officials have expressed concern that the rule of the resolutely anti-American Shi'ite Muslim Houthis will harm their counterterrorism efforts in a country that shares a long border with Saudi Arabia, the world's top oil exporter. Yemen's Sunni Gulf neighbors have decried the Houthi takeover as a coup, and the head of the Gulf Cooperation Council Abdullatif al-Zayyani arrived in Aden to meet Hadi on Wednesday, political sources there said. The power struggle between the Houthis and Hadi casts more doubt on U.N.-sponsored talks to resolve Yemen's crisis peacefully, and exacerbates sectarian and regional splits which may plunge the country into civil war. The Houthis said on Tuesday that Hadi had lost his legitimacy as head of state and was being sought as a fugitive from justice.